Welcome to Language-Learning Resources for Swahili! This site is an on-going project to organize materials to help Swahili learners (including myself) learn the language as well as the culture of East Africa. As an advanced learner of Swahili, this website will include resources tilted towards advanced students; however, I will also try to include resources for beginners and intermediate students when possible. From: "Where Swahili is Spoken." Stanford University Swahili Department. Sangai Mohochi and Michael Wairungu, n.p., n.d.. 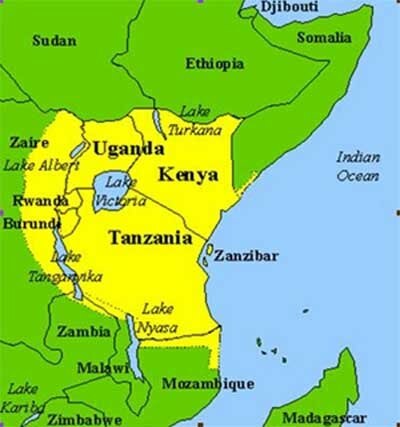 It is estimated that Swahili is spoken by more than 100 million speakers, but only around two million speakers are thought to be native speakers-or speakers who learned Swahili as their mother-tongue. Swahili culture is a blend of local, traditional customs found on the coast with influences from foreign cultures including, for example, India, Oman (or the Arabian Peninsula more generally), and Portugal. * More information on learning Swahili and learning about the Swahili culture can be found on this website by clicking the headings at the top of the page called Language Resources and Cultural Resources. *This information on Swahili was found on: "Kiswahili." Stanford University Swahili Department. Sangai Mohochi and Michael Wairungu, n.p., n.d..